Do you have a collection of dried up paint tubes you just can’t bring yourself to throwing out? Here is a way to bring the paint back to life. I found a small pestle and mortar hidden in the back of a kitchen cupboard. It turned out to be the perfect device for grinding the contents of all those dried out tubes into a fine powder, ready to be brought back to life. Next step is to grind them to a fine powder. 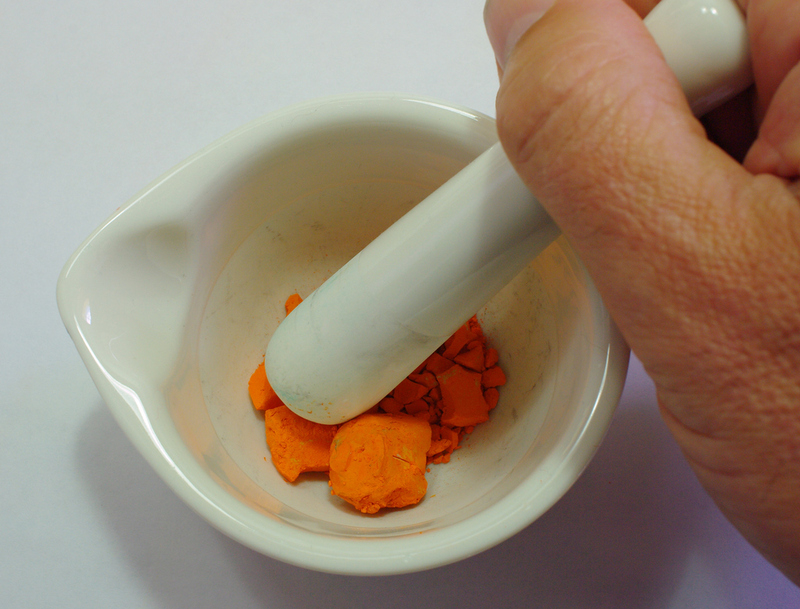 The pigment sticks to the pestle, so a metal palette knife is handy to scrape and loosen the pigment. 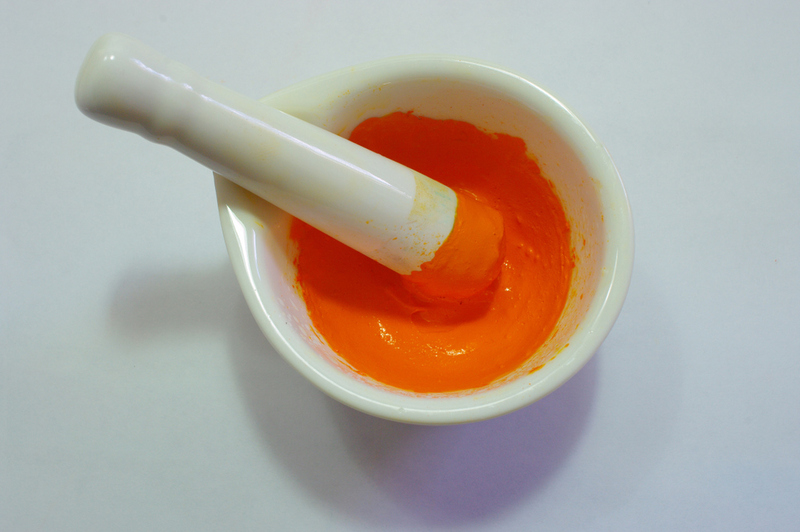 Once the pigment is a fine even powder, slowly stir in some water. Just enough to make a thick, creamy consistency. Keep grinding the paste for a few minutes to make sure there are no small, unbroken lumps left. The final step is to scoop the recycled paint into a container. These little plastic sauce containers come from the local Thai restaurant – a couple of dollars for a plastic bag full. A piece of masking tape with details identifying the brand and color is a good idea before you throw away the empty tube. Some pigments contain heavy metals such as Cobalt and Cadmium (check the warnings on the tube). Be careful not to breathe in or swallow the dust off these. Wear a suitable mask if in doubt. This entry was posted in Art Materials, Mixed Media, Uncategorized, Watercolor and tagged Art Materials, Dried Paint Tubes, painting materials, Painting tips, Watercolor, watercolor materials by splashingpaint. Bookmark the permalink. Great idea, John. Thanks. I wonder if this will work with gouache? I think I have a dried out tube of white. I’ll let you know how it turns out, though I’ll have to buy another morter and pestle… don’t want to use the one in which I grind spices or the above reason. 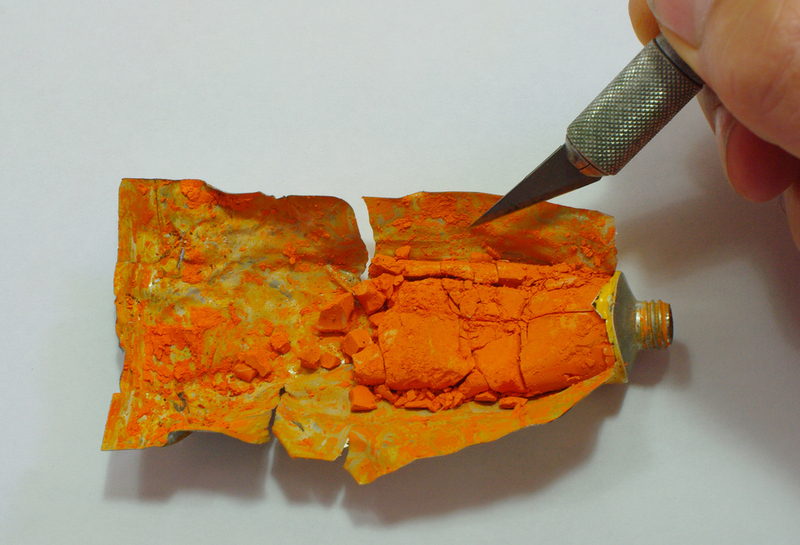 The tube of Chrome Orange I used in the demo was Gouache and it is perfectly usable again. I still have to face up to the consequences of pinching the pestle and mortar – I don’t think it will be missed though, It’s too small to grind anything but dried paint! Thanks for adding the link from your blog last week. Great tip! I have several tubes that are good candidates. Thank you. I have tubes of paint that were passed on to me that are at least 30 years old or older and this advice from you has worked a treat……. Thanks for commenting. Pleased to be able to help. Thanks for this. I would probably grind up the paint and then leave it in powder form until I’m ready to use it, then take what I need and add the right amount of water (except with the heavy metal paints) to avoid them drying up again. Thanks for your comments – a good idea, save having to re grind at a later date. Hi – first visit to your site and I love your work! I just got back from a visit to Tuscany and was googling “terracotta” – in order to mix the color for a painting. It appears that you do painting tours in sicily – I’d be interested in getting information for next year if you are still doing that!! As soon as details are finalised I will post all the information on my website and announce it on this blog. Sounds great! I’ll keep an eye on your website. Thanks for your comment. Glad you found the post useful. Thanks! Never thought of that. But I’ll need another motar and pestle too! Yes, ground herbs wouldn’t be the same mixed with Phthalo Blue or Winsor Red! What a great tip! It always kills me to toss a rock-hard tube of paint away.